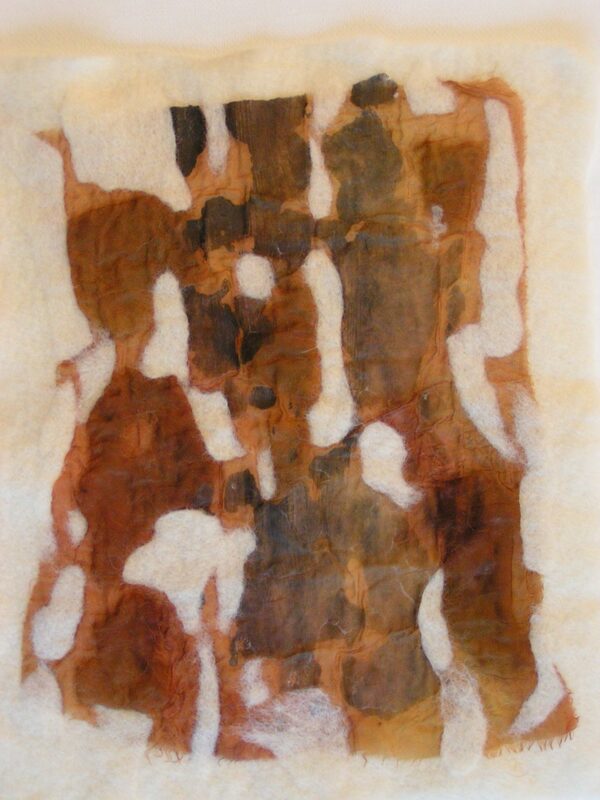 Last week I showed you a paper fabric laminated nuno felt bark sample. It looked like this before stitching and painting. I added some seed stitch, stem stitch and french knots. I used a hand dyed variegated wool thread. I then started painting with a variety of acrylic paint colors. I mixed the neutrals from mostly red and green. In the close up photo, you can see the red and green a little better. I let that layer of paint dry and then decided I still needed a bit more of the darkest values to give it a bit more contrast. Looking at the photo now, I might add even a bit more of the really dark. I also think I will crop it in a little closer to have less of the left edge. What do you think? Does it look like bark? The inspiration for this type of bark is Ponderosa Pine. 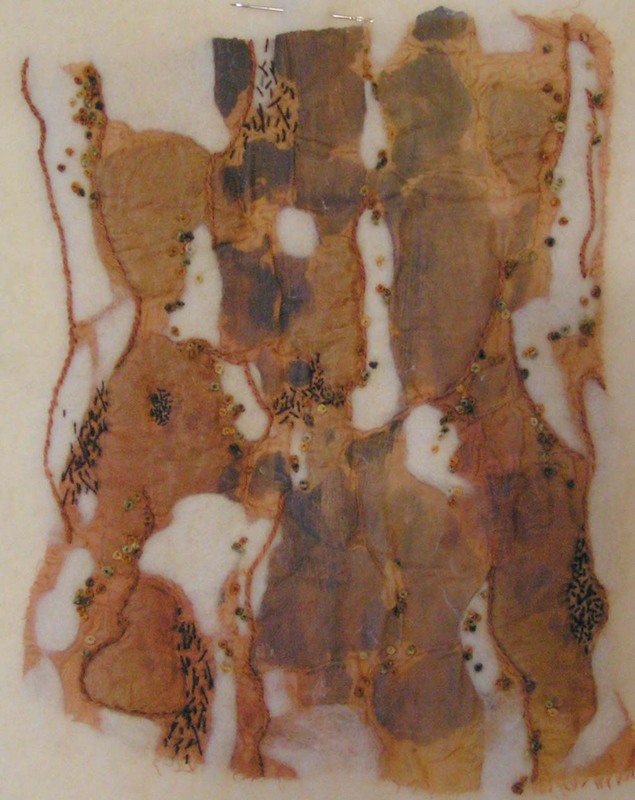 This entry was posted in Mixed Media, Nuno Felting and tagged acrylic paint on felt, fabric paper lamination + nuno felting, felted bark sample. Bookmark the permalink. That looks fantastic! Totally like bark! Couldn’t get any bark-ier Ruth – wonderful! Yes, I would give it a teensy crop on the left. Thanks Lyn, now I need to make a matte to fit into my tree studies sketch book. Next year would be fine to be in your class. Thanks Jifke! I will post a schedule for next year soon for my classes. I hope you will show us your hats over on the forum. I would love to see them. Your bark looks authentic. Great job! I certainly looks like bark. I like the left hand side myself. Thanks Ann, I just used a matt. I can still change my mind. Thanks Zed, the plan all along was to not have any white left so just kept painting until I liked what I saw.